UIQ in Love_A Love of UIQ: The Unmaking-of is the title of a two-day workshop or ‘seeance’ led by filmmakers and artists Silvia Maglioni and Graeme Thomson to make Félix Guattari’s unmade sci-fi film Un Amour d’UIQ exist as a collective experience, and to expand the territories of the film’s ‘body’ and its narrative trajectories. 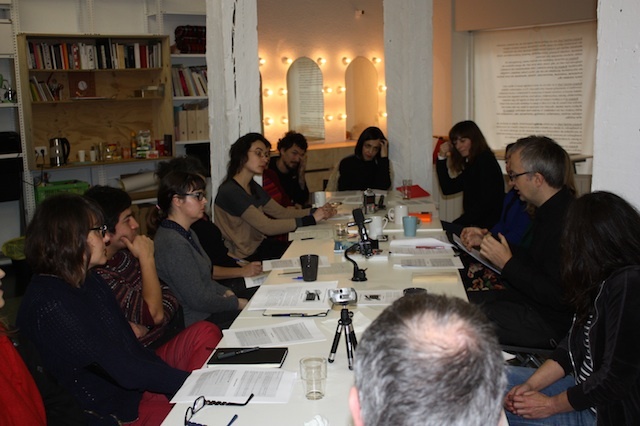 The workshop UIQ in Love_A Love of UIQ: The Unmaking-of will take place on January 16 and 17. It includes the screening of In Search of UIQ. Guattari’s script describes what happens when an invisible alien force from a parallel dimension – the Infra-quark Universe – makes contact with a group of humans and begins to desire a form (a face, a body, a language) commensurate with the world of its hosts. As the filmmakers write, “In this seeance we want to consider Guattari’s screenplay as an unstable, potential entity whose coming into being has to be negotiated through an ongoing process of translation and transduction. One of our aims is to ‘produce’ this becoming-film collectively, but without filming a single shot. Instead, the film will manifest itself through a process of contamination/contagion, by ‘translating’ the script’s DNA into mental images that we can describe to each other and by investigating the Infra-quark Universe, its bodily limits, paradoxes and potentials through a molecular exploration of sound, language and body states. The seeance will be sound-recorded and fragments of it (along with those of other seeances taking place elsewhere) will be recomposed into a polyphonic soundwork for the exhibition it took forever getting ready to exist at The Showroom, London (co-curated with The Otolith Collective, 5 February– 14 March 2015). Moving surreptitiously between the modes of essay, documentary and fiction, In Search of UIQ unfolds the story of Félix Guattari’s attempts to produce a science fiction blockbuster from his original screenplay, Un Amour d’UIQ (UIQ in Love). The script imagines a hyper-intelligent, invisible, protean life force dubbed UIQ (Infra-quark Universe) that makes contact with a community of outsiders while simultaneously causing havoc to global communications networks as it begins to develop consciousness. Guattari began work on the project at the beginning of the 1980s – collaborating at one time with the independent filmmaker Robert Kramer – and his radical vision for a subversive ‘popular’ film would occupy him on and off for the next seven years. In Search of UIQ sees Maglioni & Thomson reveal key moments in the development of Guattari’s ambitious project. The film has three movements: the first evokes the prehistory of Guattari’s previous film projects around the free radio and the Italian autonomist movements; the second is part documentary, part fiction and reenacts Guattari as an unlikely alien visitor in Hollywood; and the final movement enfolds the artists’ research into Guattari’s archive around the enigmatic figure of a Finnish filmmaker who appears to have his own plans for the Un Amour d’UIQ script. Graeme Thomson and Silvia Maglioni are filmmakers and artists whose work interrogates potential forms and fictions emerging from the ruins of the moving image, and whose practice includes the creation of feature films, exhibitions, sound and video installations, performances, event-works, tube-tracts, radio shows and books. Since 2005, the artists’ production (and, on occasion, resistance to production) has emanated from Terminal Beach (http://cargocollective.com/terminal-beach), a constructivist zone for critical reflection, exploring possible new configurations of image, sound, text and politics using cinema in expanded form to reactivate lost or forgotten archives and histories and to create new modes of collective engagement with contemporary thought, occasionally in alliance with other collectives. Their work has been presented widely in international film festivals, museums and art spaces.